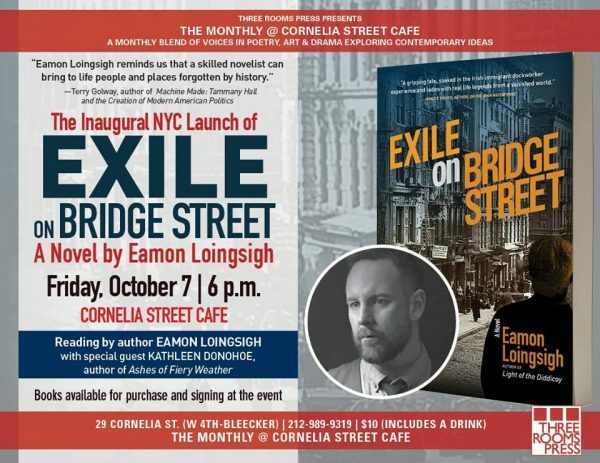 On Friday, October 7th, Three Rooms Press and Cornelia Street Cafe is thrilled to present the official New York City Launch of Eamon Loingsigh’s anticipated novel, Exile on Bridge Street. Join author, Eamon Loingsigh, and special guest Kathleen Donohoe (Ashes of Fiery Weather) for a reading and signing of the latest installment of the Auld Irishtown trilogy, Exile on Bridge Street. Loingsigh takes readers on a fast-paced adventure through time, blending the beauty and grit of New York with the violent and turbulent reality of Irish immigrants that came searching for a better life, only to find a new war of their own. Follow the story of Liam Garrity as he fights to survive in pre-Prohibition Brooklyn, where violence can erupt at any time and everything is at stake. “In Exile on Bridge Street, Eamon Loingsigh recreates the forgotten world of Irish Immigrant New York with a combination of accuracy and drama found only in the best historical fiction”- Tyler Anbinder, professor of history, George Washington University, and author of Five Points. The event will take place at 6pm at the Cornelia Street Cafe at 29 Cornelia Street, West Village, NY (between Bleeker and W. 4th). Doors open at 5:45pm. Admission is $10 and includes a free drink. Copies of Exile on Bridge Street will be available for purchase and signing at the event. Eamon Loingsigh is journalist/novelist with a long-standing fascination for the history of Irish-Americans in New York City. He comes from a family of Irish immigrants, and his grandfather and great-grandfather ran a longshoreman’s saloon on Hudson Street from 1906 to the late 1970s. He is also the author of Light of Diddicoy, the novella An Affair of Concoctions, the poetry collection Love and Maladies, and numerous articles on Irish-American history. Kathleen Donohoe is the author of Ashes of Fiery Weather, which is her debut novel. She grew up in Brooklyn, NY, where she still lives and is at work on her next book.